Imagine not being able to use your kitchen, go out on your balcony or enjoy the privacy a bathroom door provides because you can't have one. Such has been the life of Tim and Natalie Rose for the last six years, and until a few weeks ago, they had no hope that their living conditions would ever improve. But times are changing. Tim, who was born with cerebral palsy and uses a power wheelchair to get around, and his wife, Natalie, bought a suite in DuEast, a recently unveiled Daniels Corporation building in Toronto's Regent Park. It includes units designed for people who use mobility devices. Tim and Natalie weren't looking for new accommodation, having already scoured the rental and housing markets and coming up empty. Even though they could afford market rent, there was simply no accessible housing to be found, says Tim. They made changes to their apartment, removing the bathroom door so Tim could drive his wheelchair in. They paid to have an automatic front door installed. Other than the bathroom, Tim has access to one bedroom and the living room. They found out about DuEast by chance during one of Natalie's regular visits to accessibility expert/real estate agent Jeffrey Kerr's website. With Kerr's help, within the week the Roses were signing the papers to buy their dream home -- a two-bedroom, two-bathroom unit with a roll-in shower and a downtown location. "For me it was like seeing a unicorn," says Tim. "I didn't believe it at first." "It has everything we wanted and never thought we'd find," Natalie says. Their suite is one of 20 accessible units being offered through Daniel's Accessibility Designed Program (ADP). The accessible units have the same floor plans, features and upgrades as the other suites but offer roll-out/low-threshold balconies with a swing door, large roll-in showers with mosaic tile flooring and interior doorways that are a minimum of 34 inches wide to accommodate a variety of mobility devices. Entry doors have electric openers and bathrooms have fold-down seats and grab bars. But best of all, there is no extra cost for these features. Natalie says they were quick to jump on the opportunity knowing "there was fair pricing across the board. Daniels is more than a money grab." She says accessible features are "not a luxury, they're a basic necessity." An accessible kitchen that includes under-sink clearances, lower countertops, a side-opening oven and a double-door fridge is available for an additional $5,000. Suites are located throughout the building, but are mostly on lower floors. Accessible suites will be offered by Daniels in its projects going forward, says Kerr, a sales rep with Re/Max Unique in Toronto. Daniels called Kerr in January to seek advice and feedback from the expert, who has been helping buyers with accessibility challenges find homes since 2004. "Jeff is really the only one" who specializes in accessible housing, Natalie says. "My Dad says Jeff wouldn't have gone into helping people with accessibility challenges if he didn't care. The sale is more than just a commission to him." Kerr says he's happy that Daniels incorporated two of his suggestions -- the roll-in shower and roll-out balcony. Kerr referred Quadrangle Architects, a leader in universal design to Daniels as the project progressed to ensure the suites were perfectly designed. The building also has mobility features in its amenities, entrances and common spaces. Concierge desks are lower and party rooms have accessible kitchens. Kerr has been actively promoting the accessible units for a couple of months through social media and networking with his clients. A couple of his clients have already purchased suites, and Natalie and Tim say many of their friends are interested in future offerings. "It's been a lot of years since a builder recognized a need and reached out to the market. It's definitely a trail blazer," Kerr says. The developer is offering one, two and three-bedroom suites. There are only two suites on the main floor and both have been designated as accessible. 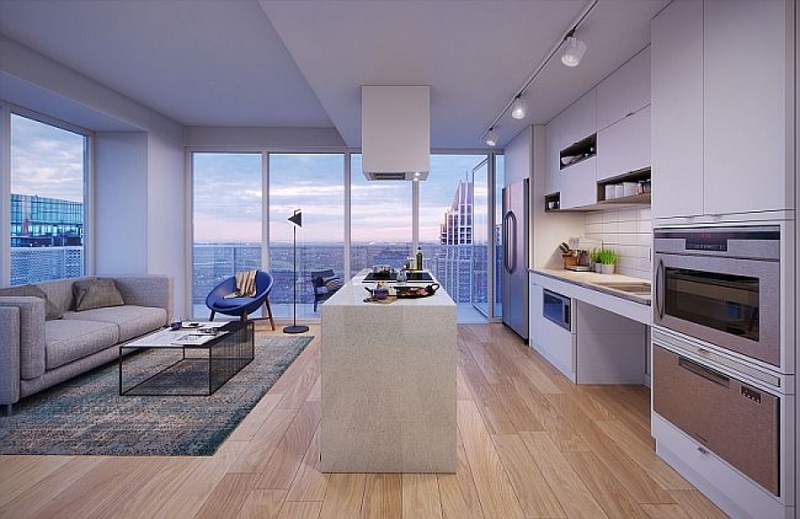 One-bedroom, one-bathroom suites with 606 square feet of living space start at $444,900. Two-bedroom, two-bathroom 855-square-foot suites start at $589,900 and three-bedroom, two-bathroom suites with 1,067 square feet are priced from $748,900. The design is not only suited to those with mobility issues. It is universal design that offers easy living spaces for families with babies in strollers or small children, or any family who has an elderly person visiting. It's a win-win situation for a living space to be able to accommodate a stroller and aging grandparents, Kerr says. Another important feature is the design -- the space is elegantly and attractively designed, not institutional, Kerr says. Accessible parking is also available. He is encouraging clients to buy now with an eye to the future. Buying accessible units (there's a shortage of accessible housing) also provides an opportunity for the savvy investor.